Probably one of our favourite activities come spring and summer is entertaining outside. And it’s one of the easiest things to do since outdoor dining areas can be created nearly anywhere in your garden, lawn, or backyard. You can easily throw a fabulous dinner party where you and your guests can enjoy good food and company on a lovely spring evening or a cool summer night. To help you, here’s a quick guide on some of the must-have elements in an outdoor garden dining area. 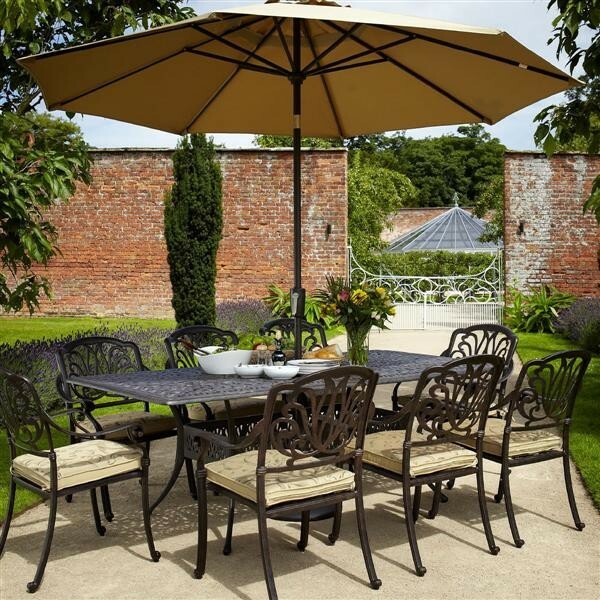 A Place of Comfort and Function Dining al fresco is one of the things you can indulge in when there is good weather, especially if you have a garden or a patio. A dining table, a couple of benches or chairs are essential in making your outdoor area a true place for entertainment and hosting. The right furniture makes your garden a great place where you and your loved ones can come together, catch up, socialise, or just enjoy quality time together. Repurposed wood, wicker, and cast aluminium bronze are just some of the popular options. Make sure that you provide comfort by throwing in pillows and cushions. Find one that fits you and your home exterior by browsing our catalogue. A Place for Warmth Barbecues, fire pits or maybe even an outdoor fireplace not only sets the ambience, it also give you an “outdoor room” that you can use all year round. These additions are a great way to give your al fresco dining area more purpose. A Place for Cover Too much sunshine, wind or rain can sometimes ruin a perfect outdoor party. For these reasons, it would be wise to create a covered space so you can truly enjoy your outdoor area. There are numerous options for you, from retractable awnings, makeshift canopies, to a parasol. They can provide adequate shade to make your dining area just perfect. If you’re a bit creative, you can also play around with some garden elements, such as arches, vines, and trees to make your own shade. Your options for designing an outdoor dining area is as plenty as the plants and accessories you can use for your garden. The trick is to find pieces that you want and you’re comfortable with, and make them work not just for the garden but also for you.